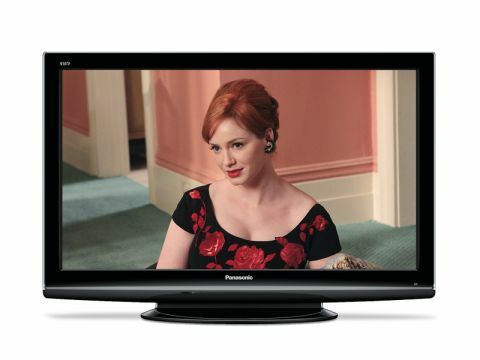 We believe the Panasonic TX-P42X10 is the cheapest 42in plasma TV ever, which means that if it can retain the technology's normal advantage over LCD, it could be a budget classic. It doesn't particularly entice you with its looks, though. The gloss black finish and silver metallic strip are pretty much in line with current mainstream aesthetic thinking, but somehow Panasonic just hasn't applied these basic elements with any real panache. Other models in this range of TV include the P19X10, P32X10 and the P37X10. Also, if you have a big living room, there is a 50in option available. The P42X10 is unspectacular with its connections, too. There are three HDMIs rather than four, and multimedia functions are restricted to the expected D-Sub PC input and an SD card slot that can play JPEG stills, but not video or music files. Other specifications are a mixed bag: the main negative lies in the fact that the screen doesn't have a full HD resolution, it's HD Ready and tops out at merely 1,024 x 768-pixels. On the plus side, contrast is quoted at a strapping 2,000,000:1 in dynamic mode, or a still exceptional 20,000:1 native. The TV also delivers Panasonic's V-real 4 video processing, as well as, surprisingly, 100Hz scanning. It's worth adding, too, that you can watch it from almost any angle without the picture losing contrast and colour saturation as so many LCD TVs are prone to. The P42X10's black level response is excellent: profound in depth and, even more importantly, full of greyscale and colour subtlety. And since the screen doesn't need to drastically dim its brightness output to get good black levels, you get dark scenes that are both punchy and impressively three-dimensional. The P42X10 is also free of motion blur, and even plasma's tendency to judder is calmed by the 100Hz engine. A selection of standard-def DVDs and Freeview broadcasts, meanwhile, are reproduced with less noise than you'd expect and generally look very natural. Improvements in LCD, LED and Panasonic's own NeoPDP plasma technology have highlighted shortcomings with the P42X10's 'original' plasma heart, though. For starters, some colours occasionally look slightly unnatural, especially when it comes to greens and blues. HD pictures don't look as sharp and detailed as we know they can either. And occasionally there's a little dotting noise over skin tones during rapid camera pans. The P42X10's sound is fair, with reasonable volume and dynamic range, though not as much treble clarity as we'd ideally like. While lacking pizzazz, the set's almost infinite viewing angle could make it, by default, the TV of choice for people whose regularly have to watch the screen from its side.